The name Honeywell is synonymous with HVAC control. They’ve been at the top of the thermostat game for so long that it’s not uncommon to encounter a homeowner who thinks that their HVAC system is made by Honeywell because that’s always been the name that they see when they change the temperature. Some companies in their position might be content to rest on their laurels, but not Honeywell. Beginning this winter and running through next spring, Honeywell is completely revamping their thermostat catalog. The goals of this update are to unify the product line and eliminate redundancies. This will reduce the number of units that you need on your truck and make it easier to install and replace Honeywell ‘stats going forward. To learn what the big changes are and when can you expect to see them, just read on! The most significant change being brought about by the T Series is Honeywell’s new UWP mounting system. Every T Series thermostat employs this system; this means that they have a common mounting plate and that replacing one T Series thermostat with another is simply a matter of swapping the cover plate. The UWP mounting system also simplifies wiring and mounting plate installation. It features simple push tab terminals for wiring and a hinged door to prevent drafts. No more keeping track of tiny screws, no more caulk! Honeywell is doubling down on Wi-Fi connectivity with the T Series. 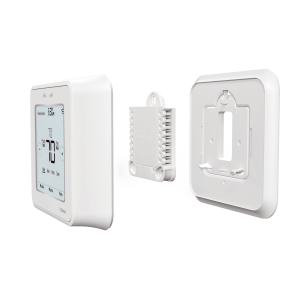 They are expanding their Lyric family of connected devices with two new internet-ready T6 Pro thermostats. As with other smart thermostats, these ones qualify for certain rebates. From ComEd, homeowners can receive up to 50% of the purchase price of the thermostat with a maximum rebate value of $100 and from Nicor customers can get a flat $50 back. Rebate forms can be found at the bottom of this post. These models feature the new UWP mounting system, making it easier than ever to install them. Homeowners can utilize the intuitive touchscreen or the recently-updated Lyric app to easily control their comfort. 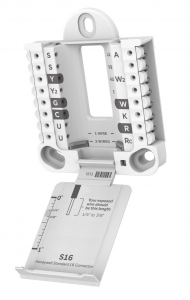 The TH6220WF2006 is a basic 2H/2C thermostat–perfect for most homeowners looking to add connectivity to their HVAC system. The TH6320WF2003 is a step up; it adds a third stage of heating control for heat pump systems as well as ventilation control with a recovery ventilator or dampers. 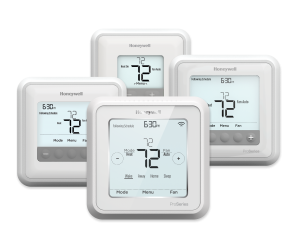 Whether you’re approaching it as a contractor or a consumer, there’s a lot to love about Honeywell’s T Series. From the reduced installation times to the expanded connectivity options, it’s easy to find something to get excited about. T Series thermostats will be available at Able Distributors soon, but you can get ready now by checking out the literature and video below! *The TH6220U2000 is a non-stock item and must be ordered special. Polish Language Literature Now Available! no problem just let me know and I’ll remove it. Regardless keep up the good work. No problem! Glad you liked it, thanks for sharing!